Jennifer Brown is author of the L.M. 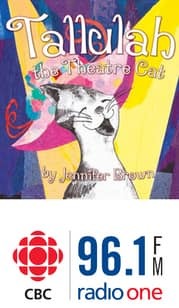 Montgomery award-winning children's book Tallulah the Theatre Cat, a new children's book being launched this weekend. It's about a cat called Tallulah and her adventures in and around the Victoria Playhouse. Author Jennifer Brown will tell us whether there's any truth to some of the tales in the book.